„Niederschlagsmengen“ nominated for the „Jahrespreis der deutschen Schallplattenkritik“ 2015. Roger Hanschel approaches classical music from another angle. What may initially appear as constant or slowly changing repetitions of patterns in unusual metres – offering the platform for lyrical excursions, expressive outbursts or virtuoso escapades, often but not always by the saxophone – reveals itself to be a metamorphosis of classical forms of composition in an unaccustomed environment, of themes that wander through the instrumental parts and much more. Indian music emerges, sequences of tones that sound Ottoman, minimal music, jazz in all forms and variations and indeed, „classical music“ – but honestly, what does „classical“ mean today? A cliché by which each person understands something different. Reason enough, then, to follow the Auryn Quartet’s need to do something different in between. Incidentally, the Auryn Quartet embarks on such excursions from ist ancestral „conventional“ world time and time again. Here, they offer the well-known Cologne „Saxophone Mafioso“ Roger Hanschel an opportunity to show his mastership in both composition and improvisation. With insatiable curiosity, Roger Hanschel has absorbed the various components of world music and created his very own personal mixture from it. And he is a stupendous virtuoso who knows how to apply new playing techniques – including permanent breathing, for example – in a (not?) breathtaking way. 15 Years after his first Collaboration with the Auryn Quartett Roger Hanschel composed once more a program for saxophone and stringquartet. Roger Hanschel approaches classical music from another angle. What may initially appear as constant or slowly changing repetitions of patterns in unusual metres – offering the platform for lyrical excursions, expressive outbursts or virtuoso escapades, often but not always by the saxophone – reveals itself to be a metamorphosis of classical forms of composition in an unaccustomed environment, of themes that wander through the instrumental parts and much more. Indian music emerges, sequences of tones that sound Ottoman, minimal music, jazz in all forms and variations and indeed, „classical music“ – but honestly, what does „classical“ mean today? A cliché by which each person understands something different. Reason enough, then, to follow the Auryn Quartet’s need to do something different in between. Incidentally, the Auryn Quartet embarks on such excursions from ist ancestral „conventional“ world time and time again. Here, they offer the well-known Cologne „Saxophone Mafioso“ Roger Hanschel an opportunity to show his mastership in both composition and improvisation. With insatiable curiosity, Roger Hanschel has absorbed the various components of world music and created his very own personal mixture from it. And he is a stupendous virtuoso who knows how to apply new playing techniques – including permanent breathing, for example – in a (not?) breathtaking way. 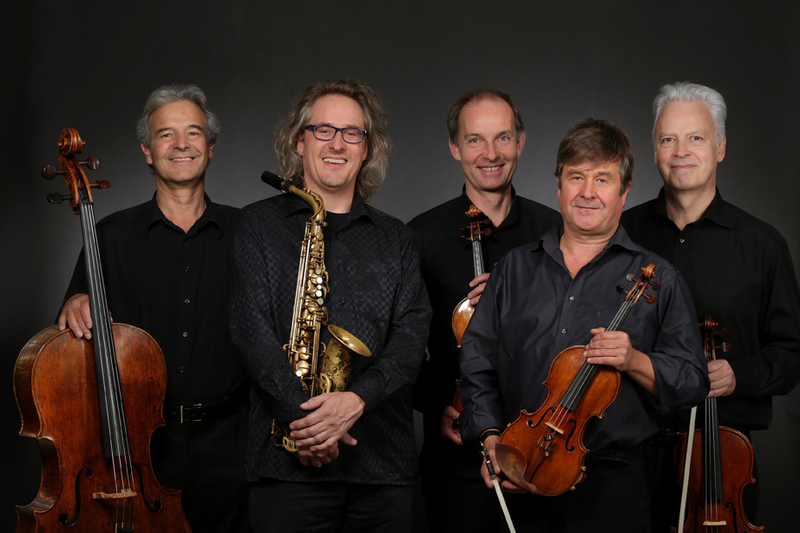 „What first catches the attention is the lightness with which Hanschel succeeds in melding the sound of his saxophone with the so homogenous sound of the string quartet. In order to reach this, he uses his perfect intonation and a clear and clean sound, often without vibrato. It is a matter here of a way of playing that is more similar to a classical musician of the French school than to a North American saxophone player. Using an aesthetic that prefers a sound of a sophisticated perfection, Hanschel fits conventional playing techniques into a naturalness that makes one forget how difficult the performance really is“.